howto | Random Thoughts - Randocity! You bought some powdered Wasabi 3 years ago in a can and forgot all about it. You’ve let it sit in your pantry all that time. You need wasabi and you remember that you have some powder. When you try to mix it up, it tastes bitter and not at all like Wasabi. There is a fix. Let’s explore. The difficulty with this green garnish is that it can be readily mimicked by horseradish, hot mustard and green food coloring when dried into a powder. Some people call this “fake” Wasabi. I simply call it “wasabi” with a lower case ‘W’. This ‘wasabi’ version is most often the powdered form that you’ll find in supermarkets and is what is most often served at Sushi restaurants in the U.S. (read the label or ask your sushi chef). If you live in North America, “wasabi” (horseradish) is typically what you’ll find 99% of the time. The 1% of the time where you find genuine Wasabi Japonica is a rarity and it means the Sushi restaurant understands the subtle, important difference in flavor between the genuine article and the horseradish version. I’ve even found fresh cut Wasabi Japonica at one sushi restaurant. That was a treat! The most often cited reason for using horseradish over genuine Wasabi Japonica is cost. While that may be mostly true, the truth is that it’s actually much more difficult to get genuine Wasabi in the US simply because it’s notoriously difficult to grow. This, of course, raises the price because you have to import it. This means importing Wasabi Japonica from places like Japan or New Zealand and there is a monetary cost to importing produce. However, the flavor profile between the horseradish version and genuine Wasabi Japonica is markedly different. Even though they both produce the signature nose heat we know and love, Wasabi Japonica simply tastes different. Dried and powdered wasabi, whether genuine or horseradish must be rehydrated to be useful in all of its green pasty glory. The difficulty with its powdered form is that, depending on the powder’s age, it takes longer and longer to hydrate fully to bring back its signature heat. This is called blooming. For example, if you hydrate wasabi powder and immediately taste it, you’ll notice no heat at all. It’ll only taste bitter. This means that the wasabi has not yet bloomed. You must wait a period of time before the wasabi has fully bloomed back into its signature hot flavor and lost that bitterness. How long that bloom takes depends entirely on the …. Let’s get back to that old powder you have sitting in your cupboard. The longer the wasabi sits in a zippered bag, can or jar, the slower it takes to rehydrate. As I said above, it will take time to bloom back into its signature flavor. How long it takes depends on how old your wasabi powder is. So, don’t throw your powder away if you rehydrate the powder and it still tastes bitter 10 minutes later. You might be thinking that because it’s bitter it’s bad. It isn’t bad. It’s just super dry. Sure, fresh powder hydrates to full strength in about 8-10 minutes. If you need some wasabi quick, getting fresh powder from the store may be your best answer. If you can plan ahead a little, your aged wasabi powder may take up to 24 hours to reach full flavor. For several year old powder, simply mix it up, place it into a closed container and let it finish blooming in the fridge. I personally have some aged wasabi powder that now takes up to 24 hours to bloom. This is a horseradish + hot mustard version. I keep a small amount ready in the fridge as a condiment. When it gets low, I hydrate more and let it bloom overnight. I do have some genuine Wasabi Japonica powder which blooms fully in about 8 minutes. But, I only use that for special occasions or if I need some quick. I use the horseradish version when I’m mixing it into ketchup, mayonnaise or mustard or for any other recipe purposes. Don’t throw out your older powder thinking it’s bad because it appears to remain bitter. You just need to wait longer to let the flavor work its way back out. The fix to old powder is that might take up to 24 hours in the fridge to fully bloom! However, it also means you need to plan ahead when using older wasabi powder. You might be thinking you can heat the hydrating bitter wasabi and make it hydrate faster. Never do this. It doesn’t work. It will make the wasabi gluey and useless. It will become bad and you will have to toss it. Do not heat wasabi powder when hydrating it. Instead, mix it up with water and let it rehydrate in the fridge overnight. If you’re new to wasabi and you’re wondering how to rehydrate it, it’s simple. Grab a small container and put a teaspoon of powder in the container. Now, fill your teaspoon with water and pour about half in and begin mixing. If the powder is still too dry and thick, add a little more water to bring it to a paste consistency you like. If you like being able to shape it into a ball with your fingers, then you’ll want it a little dryer. If you like it a little more runny, then add more water. The consistency of the paste doesn’t play a part in blooming speed. The water does need to be mixed in thoroughly, though. The paste simply needs to sit to fully bloom and that takes time. Speaking of hot mustard, this problem also applies to cans of hot mustard powder as well. As always, if you have found this Randocity article useful and it helped you revive some old wasabi powder, please leave a comment below. How to iCloud unlock an iPad or iPhone? A lot of people seem to be asking this question. So, let’s explore if there are any solutions to the iCloud unlock problem. Apple’s iCloud Lock: What is it? Let’s examine what exactly is an iCloud lock. When you use an iPhone or iPad, a big part of that experience is using iCloud. You may not even know it. You may not know how much iCloud you are actually using (which is how Apple likes it) as it is heavily integrated into every Apple device. The iCloud service uses your Apple ID to gain access. Your Apple ID consists of your username (an email address) and a password. You can enable extended security features like two factor authentication, but for simplicity, I will discuss devices using only a standard login ID and password… nothing fancy. iCloud is Apple’s cloud network services layer that support service synchronization between devices like calendaring, email contacts, phone data, iMessage, iCloud Drive, Apple Music, iTunes Playlists, etc. As long as your Apple ID remains logged into these services, you will have access to the same data across all of your devices. Note, your devices don’t have to use iCloud at all. You can disable it and not use any of it. However, Apple makes it terribly convenient to use iCloud’s services including such features as Find my iPhone, which allows you to lock or erase your iPhone if it’s ever lost or stolen. One feature that automatically comes along for the ride when using iCloud services is an iCloud lock. If you have ever logged your iPhone or iPad into iCloud, your device is now locked to your Apple ID. This means that if it’s ever lost or stolen, no one can use your device because it is locked to your iCloud Apple ID and locked to Find my iPhone for that user (which I believe is now enabled by default upon logging into iCloud). This also means that any recipient of such an iCloud locked device cannot use that device as their own without first disassociating that device from the previous Apple ID. This lock type is known as an iCloud lock. This type of Apple lock is separate from a phone carrier lock which limits with which carriers a phone can be used. Don’t confuse or conflate the two. I should further qualify what “use your device” actually means after an iCloud lock is in place. A thief cannot clean off your device and then log it into their own Apple ID and use the phone for themselves. Because the phone is iCloud locked to your account, it’s locked to your account forever (or until you manually disassociate it). This means that unless you explicitly remove the association between your Apple ID and that specific device, no one can use that device again on Apple’s network. The best a would-be thief can do with your stolen phone is open it up and break it down for limited parts. Or, they can sell the iCloud locked device to an unsuspecting buyer before the buyer has a chance to notice that it’s iCloud locked. If you’re thinking of buying a used iPhone from an individual or any online business who is not Apple and because the iCloud lock is an implicit and automatic feature enabled simply by using iCloud services, you will always need to ask any seller if the device is iCloud unlocked before you pay. Or, more specifically, you will need to ask if the previous owner of the device has logged out and removed the device from Find my iPhone services and all other iCloud and Apple ID services. If this action has not been performed, then the device will remain iCloud locked to that specific Apple ID. You should also avoid the purchase and look for a reputable seller. What this means to you as a would-be buyer of used Apple product is that you need to check for this problem immediately before you walk away from the seller. If the battery on the device is dead, walk away from the sale. If you’re buying a device sight unseen over the Internet, you should be extremely wary before clicking ‘Submit’. In fact, I’d recommend not buying used Apple equipment from eBay or Craigslist because of how easy it is to buy bricked equipment and lose your money. Anything you buy from Apple shouldn’t be a problem. Anything you buy from a random third party, particularly if they’re in China, might be a scam. Can iCloud Lock be Removed? 1) This one requires technical skills, equipment and repair of the device. With this solution, you must take the device apart, unsolder a flash RAM chip, reflash it with a new serial number, then reassemble the unit. Cons: May not work forever if Apple notices the faked and changed serial number. If the soldering job was performed poorly, the device hardware could fail. 2) Ask the original owner of the device, if you know who they are, to disassociate the iDevice from their account. This will unlock it. Pros: Makes the device 100% functional. No soldering. Cons: Requires knowing the original owner and asking them to disassociate the device. 3) Contact Apple with your original purchase receipt and give Apple all of the necessary information from the device. Ask them to remove the iCloud lock. They can iCloud unlock the device if they so choose and if they deem your device purchase as valid. Pros: Makes the device 100% functional. Cons: Unlocking Apple devices through Apple Support can be difficult, if not impossible. Your mileage may vary. 4) Replace the logic board in the iPad / iPhone with one from another. Again, this one requires repair knowledge, tools, experience and necessary parts. Pros: May restore most functionality to the device. Cons: Certain features, like the touch ID button and other internal systems may not work 100% after a logic board replacement. As you can see, none of these are particularly easy, but none are all that impossible either. If you’re not comfortable cracking open your gear, you might need to ask a repair center if they can do any of this for you. However, reflashing a new serial number might raise eyebrows at some repair centers with the assumption that your device is stolen. Be careful when asking a repair center to perform #1 above for you. It seems that the reason the iCloud Lock came into existence is to thwart thieves. Unfortunately, it doesn’t actually solve that problem. Instead, it creates a whole new set of consumer problems. Now, not only are would-be thieves stealing iPads still, they’re selling these devices iCloud locked to unsuspecting buyers and scamming them out of their money. The thieves don’t care. The only thing this feature does is screw used device consumers out of their money. That Apple thought they could stop thievery by implementing the iCloud lock shows just how idealistically naïve Apple’s technical team really is. Instead, they created a whole new scamming market for iCloud locked Apple devices. In fact, the whole reason this article exists is to explain this problem. For the former owner of an iPad which was stolen, there’s likely no hope of ever getting it back. The iCloud lock feature does nothing to identify the thief or return stolen property to its rightful owner. The iCloud lock simply makes it a tiny nuisance to the thief and would-be scammer. As long as they can get $100 or $200 for selling an iCloud locked iPad, they don’t care if it’s iCloud locked. In fact, the fact that this feature exists makes no difference at all to a thief. It may reduce the “value” of the stolen property some, but not enough to worry about. If it was five finger discounted, then any money had is money gained, even if it’s a smaller amount than anticipated. For thieves, the iCloud lock does absolutely nothing to stop thievery. Here’s the place where the iCloud lock technology hurts the most. Instead of thwarting would-be thieves, it ends up placing the burden of the iCloud lock squarely on the consumer. If you are considering buying a used device, which should be a simple straightforward transaction, you now have to worry about whether the device is iCloud locked. It also means that buying an iPhone or iPad used could scam you out of your money if you’re not careful. It’s very easy to buy these used devices sight unseen from online sellers. Yet, when you get the box open, you may find the device is iCloud locked to an existing Apple ID. At that point, unless you’re willing to jump through one of the four hoops listed above, you may have just been scammed. If you can’t return the device, then you’re out money. The only organization that stands to benefit from the iCloud lock is Apple and that’s only because they’ll claim you should have bought your device new from them. If this is Apple’s attempt at thwarting or reducing used hardware sales, it doesn’t seem to be working. For the consumer, the iCloud lock seems intent on harming consumer satisfaction for device purchases of used Apple equipment… a market that Apple should want to exist because it helps them sell more software product (their highest grossing product). For actually honest sellers, an iCloud lock makes selling used iPad and iPhone devices a small problem. For unscrupulous sellers, then there is no problem here at all. An honest seller must make sure that the device has been disassociated from its former Apple ID before putting the item up for sale. If an honest seller doesn’t know the original owner and the device is locked, it should not be sold. For the unscrupulous sellers, the situation then becomes the scammer selling locked gear and potentially trafficking stolen goods. It should be said that it is naturally assumed that an iCloud locked device is stolen. It makes sense. If the owner had really wanted the item sold as used, they would have removed the device from iCloud services… except that Apple doesn’t make this process at all easy to understand. Here’s where Apple fails would-be sellers. Apple doesn’t make it perfectly clear that selling the device requires removing the Apple ID information fully and completely from the device. Even wiping the device doesn’t always do this as there are many silent errors in the reset process. Many owners think that doing a wipe and reset of the device is enough to iCloud unlock the device. It isn’t. As a would-be seller and before wiping it, you must go into your iPad or iPhone and manually remove the device from Find my iPhone and log the phone out of all Apple ID services. This includes not only logging it out of iCloud, but also logging out out of iTunes and Email and every other place where Apple requires you to enter your Apple ID credentials. Because iOS requires logging in multiple times separately to each of these services, you must log out of these services separately on the device. Then, wipe the device. Even after all of that, you should double check Find my iPhone from another device to make sure the old device no longer shows up there. In fact, you should walk through the setup process once to the point where it asks you for your Apple ID to confirm the device is not locked to your Apple ID. This is where it’s easy to sell a device thinking you’ve cleared it all out, but you actually haven’t. It also means that this device was legitimately sold as used, but wasn’t properly removed from iCloud implying that it’s now stolen. Instead, Apple needs to offer a ‘Prep for Resell’ setting in Settings. This means this setting will not only wipe the device in the end, but it will also 100% ensure an iCloud unlock of the device and log it out of all logged Apple ID services. This setting will truly wipe the device clean as though it were an unregistered, brand new device. If it’s phone device, it should also carrier unlock the phone so that it can accept a SIM card from any carrier. Apple makes it very easy to set up brand new devices, but Apple makes it equally difficult to properly clear off a device for resale. Apple should make this part a whole lot easier for would-be sellers. If need be, maybe Apple needs to sell a reseller toolkit to scan and ensure devices are not only iCloud unlocked, but run diagnostic checks to ensure they are worthy of being sold. If you like what you’ve read, please leave a comment below and give me your feedback. [UPDATED: 12/17/2018] TRU officially closed all remaining US stores as of mid-summer. This article is here simply for legacy reasons. Buh-Bye TRU and thanks for all the fun. We’ll miss you this holiday season. If you’re thinking of visiting Toys R Us to take advantage of the store closing liquidation sales, this is your safety guide. Don’t throw your money away at Toys R Us, make every dollar count. Let’s explore. Toys R Us’s liquidation is All Sales Final. The first tip is pretty straightforward. If you’re looking to buy a gift for a child, you are trying to stock up for the holidays or for any other rainy day reason, keep in mind that you cannot return, exchange or refund anything you purchase at this time. For gifts, this can be critical, particularly with children. You should always make sure that the person who receives that gift can return or exchange it if they don’t like it. Purchasing from Toys R Us on liquidation, you forfeit the return option. Even if the gift is to be given while Toys R Us is still open, there are no refunds or exchanges. So, be aware that whatever gift item you choose is theirs to keep forever. You might want to be prepared to perform an exchange with your own money. Note that this can become an uncomfortable situation. If you know there’s a possibility that your gift might be returned, you should buy from Amazon, Target or Walmart instead which leaves that option open for the recipient. This goes hand-in-hand with All Sales Final. If you purchase items from Toys R Us during liquidation, you may get a great deal, but at the cost of no refunds, returns or exchanges. Make absolutely certain that what you buy is absolutely something you intend to keep. Whether or not you intend to give the item as a gift, you should open the item and check it thoroughly. Do it in the store if at all possible. If it has batteries, make sure to test the item for functionality. You may not be able to test a battery powered item in the store, however. They may not allow you to remove the item from its packaging in the store to perform this test. You may have to take it home and check it there. By that time, you’ve already purchased and it’s too late if it’s defective. If you’re in doubt, leave it at the store. If you do find a dead or defective item, you will need to contact the toy manufacturer directly and work your exchange through the manufacturer. Keep your receipt. This exchange process could take a whole lot more time than if you bought at a store still accepting exchanges. Consider your purchases during a liquidation carefully. Do not purchase Toys R Us gift cards… but this should go without saying. If you decide to buy an expensive item that could break easily, you should ask of Toys R Us to offer you a SquareTrade warranty plan. This will ensure you can get a replacement after Toys R Us closes. In preparation for this article, I spoke with a representative at SquareTrade who confirmed that they will continue to honor all SquareTrade warranties purchased at Toys R Us. If you do decide to invest in an expensive item that is prone to defects or breakage, you should also consider purchasing a SquareTrade warranty during liquidation. Purchased video game content is a reasonably safe investment during the Toys R Us liquidation. It’s rare that a disc or a cartridge is defective. On the other hand, purchasing a video game console or other video game hardware is a bad idea. If you must purchase one, purchase a SquareTrade warranty at Toys R Us to go with it (assuming they are still selling these warranty plans). If it’s not SquareTrade, then you should call the plan service provider before you check out at the store to ensure that insurance plan will continue to cover your purchase after Toys R Us closes for good. Without an extended service plan, you have no replacement policy if it’s defective or gets broken. Be very cautious of buying video game hardware from Toys R Us during liquidation without a warranty. Though, you can try to work through the manufacturer warranty, it’s sometimes only 90s days. During liquidation, this is the one time where you should consider the purchase of a third party warranty, at least for purchases like video game consoles… particularly the Nintendo Switch which is portable and prone to being dropped. However, certain types of lesser expensive video game hardware, like controllers, wires, Amiibo, cases, pens and other similar $30-$50 items are safer to buy, particularly when they are marked down 50% or more. However, consoles themselves, like the Nintendo Switch, Xbox One X and PlayStation 4 are not considered good investments from a liquidation sale. I’d also suggest to avoid buying these devices from eBay as well because many will flood eBay listings from sellers who went to Toys R Us just to cash in on these low prices. If you’re thinking of buying a console from eBay, ask where it was purchased. Be wary if it’s from Toys R Us. Toys that don’t require batteries and don’t have complex moving pieces are some of the safer items to buy. They offer less defects and are more likely to last the test of time than RC vehicles, video game consoles, battery powered electric child cars, electric skate boards and other custom battery items. Toys R Us was very good at keeping up with safety recalls. Unfortunately, they are going out of business. This also means that any toys you purchase during the liquidation that later fall under a recall, you can no longer return to Toys R Us. Like the All Sales Final discussion above, consider that items like cribs, baby items and other possible dangerous infant and toddler toys won’t have any place to go if they are recalled, especially if your baby gets hurt. Though, the manufacturer might honor a return or exchange, you will not be able to do so at Toys R Us. You will also not be able to make any legal claims of injury to Toys R Us once they have closed. Here is a list (not exhaustive) of items that I consider safe, somewhat safe and not safe for a liquidation purchase so long as you fully understand that you cannot return or exchange them at TRU. Note, safe, somewhat safe and not safe represent what I consider as a “safe purchase” (i.e., getting value for your money vs. throwing your money away), these labels do not describe whether the toy or item itself is safe for use by a child. You will have to determine toy safety yourself. Bicycles Somewhat Unsafe Depends If you’re buying for a gift, unsafe. If you’re buying to use now, perhaps. If it has a battery, unsafe. TRU may or may not offer assembly. it may be safe or unsafe. Choose carefully. Video Game Controllers Somewhat Safe Yes Typically okay along with certain accessories. baby toys and items via liquidation sales. Cribs Not Safe No Cribs can be dangerous for infants. Purchase at a store where you can return. Car Seats Not Safe No Car Seats can be dangerous for infants. Tablets Somewhat Safe Yes If Apple, you can rely on Apple. If another brand, avoid. The above is not an exhaustive list, so always use your best judgement if it’s not listed here. If the toy contains no battery at all, it should be fine. If the toy contains or uses standard AA, AAA, C, D or button cell batteries, you’re fine. If the toy contains a lithium ion and/or custom battery, you should avoid purchase. Any toy that contains a custom battery may have been custom made for Toys R Us. This means you may find it difficult or impossible to find batteries later. House brand or Toys R Us exclusive toys requiring refill packs should be avoided. Toys and products for infants should be avoided for safety reasons. The only product I would suggest is safe for an infant is diapers and possibly formula as long as it’s a name brand, not a house brand. Tablets and electronics should be avoided if not from Apple or another recognized brand. If it’s a house branded electronic item, avoid. Toys R Us Exclusives are now considered rare. However, that doesn’t mean they’re a good investment. Pop figures are fine, exclusive Barbies are fine and exclusive Hot Wheels are fine (see the list above). However, any exclusives that require something that you can only get at Toys R Us (like batteries or refills), you should avoid purchase. These are likely to be some of the rarest toys available. If you want a piece of memorabilia to commemorate Toys R Us, you should head over fast and pickup whatever Geoffrey items you can find. If you’re looking for plush, you might have to ask at the service desk. Happy Deals and good luck! Unfortunately, we haven’t yet reached the required 25 subscriber entry mark as of December 31, 2018. As a result, the deadline for entry as been extended until the last day of March 2019. I really want to give this controller away to one of Randocity’s fantastic readers. If you wish to enter, please keep reading. Some great news! As a thank you to all of my readers, I’m giving away a 500 Million Limited Edition PS4 DualShock Controller. To qualify for this controller giveaway, please read this article (you’re already on your way), follow this blog, like this blog post, Tweet about it on Twitter and leave a positive comment below (must complete all 5 of these actions). One blog follower will be randomly chosen from all who have successfully completed all actions. All entrants must complete all 5 actions before December 31st, 2018 11:59:59 (extended to) March, 31st, 2019 11:59:59 US Pacific Time. Please visit this Gleam entry page to confirm you have completed all of your actions and to submit your entry. Gleam must show 5 entries to be qualified to win. Make sure you Tweet about it using the instructions given on the Gleam entry form. Be sure to actually follow this blog, like this article and leave a comment below in addition to tweeting and visiting. Marking that you have completed all actions via Gleam, but not having them completed them will disqualify your entry until you have completed all actions. Failure to complete all 5 actions before 3-31-2019 11:59:59 US PT will disqualify your entry. The winner will be chosen and notified the first week of April 2019. To follow this blog, you will either need to create a WordPress.com login or follow by email (scroll down in the sidebar to follow by email). To like this article, you will need to create a WordPress.com login. It doesn’t cost anything to sign up or follow by email. Please use a valid email address as that’s the only way I can contact the winning subscriber. Ensure you are using the same email address between Gleam and WordPress so I can confirm your entries. There must be at least 25 qualified entrants for the giveaway to take place. All entrants must be at least 18 years of age or older and must verify age. Although this giveaway is open throughout the world, the winner must live in a country where I can ship the PS4 controller. Good Luck! We all know the drill. You’ve just run out and spent $65 for that new and oh-so-cool 500 Million Limited Edition DUALSHOCK 4 controller for your PS4. Well, now you’ve got to go through that hassle of pairing it with your console. But, why can’t I pair it wirelessly? You can. Let’s explore. If you don’t have a flat screen with CEC or CEC is not enabled, you better go find that USB cable. PS4 DUALSHOCK 4 controllers are bluetooth devices and like all bluetooth devices you can pair them wirelessly. Of course, you can’t pair the device if it is the only device (see above), but if you happen to have other working devices to control your PS4 (like another controller or a media remote), you’re good to go to with wireless pairing. Before you start this process, go to the PS4’s Settings => Devices => Bluetooth Devices area and leave it on this screen. On this screen you’ll see all your paired devices and this is also where all new unpaired devices will appear. Unpaired devices will have no grey or green dot next to them. How to begin? Press and hold the PS button and the sharing button simultaneously. The sharing button is the small black oval button to the upper left of the touch pad labeled creatively enough SHARE. Press and hold the PS and sharing buttons until the lightbar begins to strobe quickly (approximately 3-5 seconds). While it’s quickly double strobing, it’s in the pairing state like any other bluetooth device. If the strobe is a slow on and off, then the controller is trying to connect to your PS4 or PC. This isn’t what you want. If it’s slow strobing, then you’ll need to wait until it stops to try again. Pressing the PS button before the share button could lead you into slow strobing. So, I would suggest pressing and holding the share button slightly before you press and hold the PS button to avoid triggering the slow strobe. Once it’s double strobing, look at your screen under Bluetooth Devices and look for the DUALSHOCK 4 that has no dot (probably at the bottom of the PS4 screen). Using a working controller or remote, select the new controller and complete the pairing on the next screen. 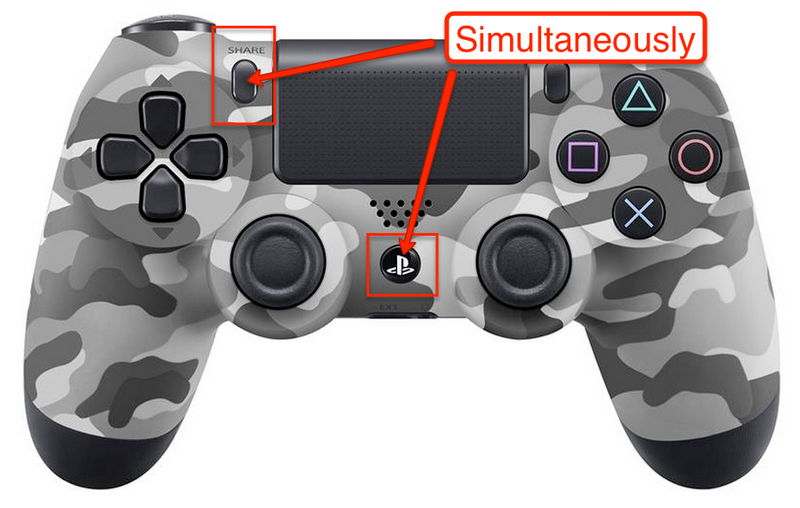 If you don’t see your DUALSHOCK 4 device in the list, check to make sure the device is still in pairing mode. If not, put it in pairing mode. If it’s still in pairing mode, back out of that screen and then go back into it. This will force a search refresh for new devices. Hopefully it will appear now. If not, move closer to the PS4 with the new controller. If this all fails, use the USB pairing method above… again, time to go dig out that cable. Once paired, you can now use the controller normally. Don’t have access to your PS4? I’ve had a number of comments on this article regarding corruption or rebuilding of a PS4 after a new hard drive insertion. 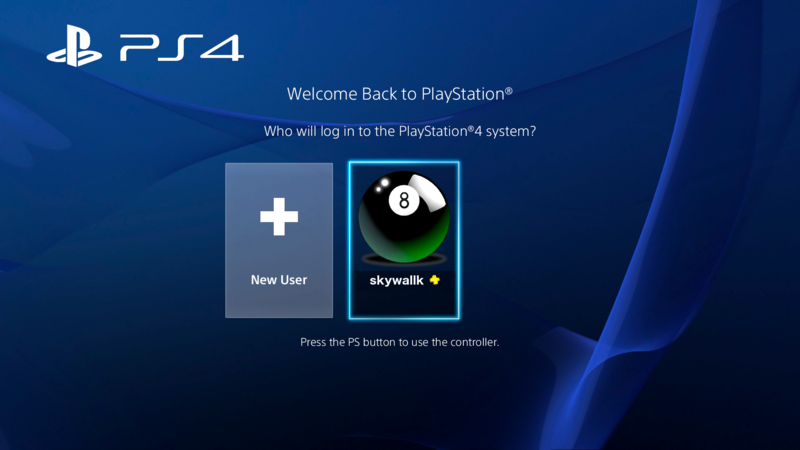 Before you lose access to your PS4 entirely either because you failed to power off the unit properly, because the hard drive failed or because you replaced the hard drive, you should make sure you have some alternative form of PS4 XMB menu control. You have to remember to set this up while you still have a working PS4. You won’t be able to easily do some of these steps after you lose access and cannot find or do not have a proper microUSB pairing cable. Note, if you are replacing the PS4’s hard drive, setting anything up in advance probably won’t work as the new hard drive will need to be reinstalled with a new operating system. So, any settings will be lost on hard drive replacement… skip down to Wired Controller below or be prepared with a PS4 compatible micro USB cable. Many flat screens today support control of the PS4 through the HDMI cable using your TV’s remote control. This is called HDMI-CEC or simply CEC. You must enable this on both your TV and on the PS4 while you have a controller that works. To enable this on your PS4, go to Settings=>General=>HDMI link and check this box. Now, go to your TV and enable CEC / HDMI Link to control the connected PS4 with your TV’s remote. Not all TV manufacturers call it CEC, some call it something with the word ‘Link’ in the name, but the protocol is standard. Once enabled, reboot your PS4 and then turn your TV off and then on. CEC control has changed in a recent PS4 system update. When you have CEC enabled, the remote is now considered a controller. Once you flip over to the PS4’s HDMI port on your TV, the PS4 should turn on. Once booted up, the remote control should present as a controller (see screenshot to the right). The screen should show your login ID. Press your ENTER or OK key on the remote to enter into the XMB menu. Apparently, Sony realized this intrinsic problem with CEC and updated the PS4 to now allow the remote control to be recognized as an XMB controller on the bootup screen. What this all means is that you can now fully control your PS4 with your TV’s remote control without needing a DS4 controller at all. With CEC, you can now pair your controller using your TV’s remote through settings. Though, I wouldn’t recommend trying to play games using your TV’s controller. If the PS4’s screen does not show the login ID panel and simply has the words “Press the PS button to use the controller” in the middle of the screen, the PS4 has not recognized a controller. This can be for several reasons. If you powered the PS4 on before flipping to it via HDMI, the PS4 doesn’t see the TV as the controller. The device that powers the PS4 on is the device presented on the boot up screen. When you use a DS4 to power it on, the DS4 will show as the controller on the boot screen. When you use the the TV to switch to and power on the PS4, the TV’s controller becomes the default on this screen. If you can’t get the TV’s controller to show up at all, then you will need to skip down to the next section for pairing with a USB cable. As mentioned above, you will need to set CEC up on your TV and the PS4 in advance to use this feature. If you have no functional gamepad controllers, your TV doesn’t support CEC or you haven’t set CEC up in advance, skip to USB pairing. If you’ve completely lost control to your PS4 through your Dual Shock 4 and you don’t have any other way to activate a PS button and you can’t seem to get your DS4 controllers paired with a cable, you will need to use a wired controller. There are only a few PS4 wired controllers on the market, but Hori makes a couple of gamepad versions. While these gamepads are not as full featured as a Sony Dual Shock 4 (i.e., no light bar, no rumble, no speaker, no headset jack, etc), they will at least let you control your PS4 when nothing else will. Amazon also offers a few PS4 wired arcade-style stick controllers that may work. Make sure they have a PS button to launch the PS4’s XMB menu. Also, you will need to double-check that they are, in fact, wired controllers. While most third party controllers are wired, you’ll definitely want to read through the product description in the listings carefully to make sure it doesn’t use a wireless dongle. Though, a wireless dongle may work for controlling the PS4 for a short period of time, they may not work for long gaming sessions as they have tendencies to time out forcing the controller to be reconnected often. I recently picked up a Hori Pad FPS Plus. This is a very nice controller with the exception of two things. First, the shoulder buttons take getting used to because they are pressure sensitive in a different way from the DS4’s trigger shoulder buttons. Because it takes a different amount of pressure to activate them, it feels different from the trigger controllers on the DS4. Once you get used to the pressure needed for these shoulder buttons, everything else is pretty much spot on including the touch pad. And, I like the reversed placement of the D-Pad and the left joystick (like the Xbox controller). This game pad is also well made and quite light in weight because it doesn’t have the lightbar, rumble or battery. I also like that I can continue to play without worry of running out of battery. The second issue, it won’t turn on the PS4 with the press of the PS button when the PS4 is off. For me, this is only a small problem because I have CEC enabled. Simply switching to the PS4’s HDMI port turns the PS4 on. Otherwise, you’ll need to get up and touch the power button or use a DS4 to turn it on and then use PS button on the Hori to get into the menu (the DS4 controller will automatically turn off when the Hori Pad logs in). Note that there are other things the Hori Pad doesn’t have, like a headphone jack or a speaker. While I do like the speaker on the DS4, for me it doesn’t ruin the game without it. Yes, it is kind of cool when GTA5’s phone comes out of the DS4’s speaker, but it’s mostly a gimmick. Note, you can use this same pairing approach to pair this controller to other operating systems. For example, a Mac or Windows. The trouble, while the DS4 does pair, you still need a driver to map the buttons to make the controller useful. For this reason, it’s not that useful on a Mac yet, but you might try Joystick Mapper. I know the Joystick Mapper devs were working on an update to drive the DS4 controller on a Mac. For Windows, there’s InputMapper that does work. As for pairing and using it on iOS or Android, it might pair but won’t be useful. Yes, some have managed to pair it, but it doesn’t seem to have any kind of drivers or support. I’d like to see Sony create a PS Vita gaming tablet that fully supports the DS4. That would be the best of all worlds. Skip iOS and Android and go right for a full out Sony gaming tablet. But, Sony definitely needs to get more gaming devs on board to bring the blockbuster titles. But, that’s another topic entirely. While I understand Sony’s reluctance to document a wireless pairing guide like this due to the need for an already working controller, I really don’t like having to locate that special Sony microUSB cable for this process. Not all microUSB cables are equal. If you don’t have the correct Sony PS4 (or compatible) cable, the pairing process above won’t work. Because this cable looks like all other black microUSB cables, you can easily mix them up or lose them. For that $65, I don’t understand why Sony can’t include a 3′ compatible cable in the box with the controller since the PS4 is so finicky about which cable will work. I also don’t typically leave dangling cables hanging from my console for a variety of reasons including safety. So, locating this special pairing cable is not always quick in my house. I mean, one black cable looks like any other. Sony doesn’t specifically mark the cable well, so digging through a ton of microUSB cables trying to find that special Sony cable isn’t something I want to spend my time doing… especially when I already have a working controller. When you have at least some kind of a functional controller, wireless pairing is a perfectly acceptable (and more efficient) alternative. Yet, Sony’s site mentions nothing of this process. That’s the reason I document it here. If this article helped you, please leave a comment below. If you had difficulties pairing your device, please let me know that too. There are lots of very subtle actions that can be taken where you can unknowingly undermine your business success. Let’s explore. While this somewhat depends on the position, it’s still never a good sign when you must fire staff from the same position over and over. Even if you’re disenchanted with the people you’ve hired doing the specific work and after firing a position more than three times, this says more about your needs than the position. It’s clear, what you need in the position and the type of people you are hiring is mismatched. You need to rethink the job requirements for the position and hire the correct talent to fit that role. When you fire leaders in this way (i.e., VPs, SVPs or C-Level execs), this situation is even more detrimental to your business. How will this undermine your business? Firing a position more than three times says several things. First, it says you don’t know what you’re looking for. Second, for all of those people whom you’ve hired and fired, the word will get around that anyone who’s a competent candidate won’t even consider the position. Once you realize that the most talented pools are relatively small and that they do talk to one another, firing a position multiple times means the word will get around to not hire on at that company. Once the word gets around about this situation, it is never a good thing for your business. The higher the profile of the position, the stronger the word gets around and this will severely undermine your ability to acquire top-end talent. Additionally, the word will also get around in the recruiter community and they also choose not to place talent at your company. When you’re setting up your business plan, you need to thoroughly research the industry your business will be in. For example, selling a product or service to the medical industry is profoundly different than selling it to marketing teams, which is also profoundly different than selling your wares to the government or doctors or lawyers or farmers. How will this undermine your business? If you fail to properly research the types of clients you are working to obtain, you won’t understand their demands and requirements. Every industry is bound by laws and regulation (some industries more than others). If you fail to realize that the industry you are targeting requires strict compliance to laws, you may also fail to understand how those laws apply to your business and that your company’s compliance may be unattainable and far too costly. If you can’t comply with the laws, you may never be able to land the deals on which your business depends. Yes, for many companies, vendors must comply with certain laws, security requirements and industry standards before a company will agree to close your deal. Failing to research these requirements may undermine your ability to remain in business. Or, it may relegate your business to smaller companies needing much smaller deals. Sites like Glassdoor exist for a reason. Before Glassdoor, there was no transparency except by word of mouth. Now, there is. How will this undermine your business? Before Glassdoor, recruiters would make the determination of where to place candidates. Recruiters also won’t choose to place prospective employees in toxic environments. That is, environments where firings are common, where turnover is high and where employee morale is extremely low. They won’t place anyone for a very good reason… they know the new employee won’t stay long enough to allow the recruiter to collect their commission. Recruiters only get paid their commission if the placed employee stays for the specified duration of time (3-6 months depending on the placement contract). Recruiters, therefore, will not place would-be candidates into an environment they know will be a short lived role. It also likely means that when you do find recruiters who will work with your hiring needs, they likely are unaware of the problem. Though, once they place and realize they are making no money, don’t expect to hear from them again. Additionally, with sites like Glassdoor, employees can remain anonymous and be brutally honest about their experiences at the business. This can also undermine your ability to hire. Sites like Twitter and Facebook just compound the problem. As work gets around and your business’s reputation becomes tainted, you’ll find that it can be nearly impossible to not only attract good talent, but also retain it. Word of mouth in an industry is as good as gold to a job candidate, but can be poison for a business. You need to make sure your word of mouth is always high quality praise. Never negative backlash. If you choose to ignore the word of mouth, it will be to the detriment of your company. Employees spend 8 or more hours of their day working for you (not to mention commute time). Morale is a big part of that work day. If morale sinks low, your employees will exodus. Perks help keep employee morale up. Choosing the right morale boosters is critically important to employee retention. How will this undermine your business? The Shining said it best, “All work and no play makes Jack a dull boy”. I’m not recommending that you allow your employees to play. But, offering employees a place to relax when they are having a break is important. You also need to understand what other companies in your same vicinity are offering to their employees. While I understand that every company can’t offer all of the same perks, you need to offer at least some of them. Not offering perks to your employees is tantamount to telling would-be employees and recruiters, “Don’t place people here”. Word of mouth spreads, once again, and you’ll find it hard to hire strong candidates because the perks are better somewhere else. Secondarily, this goes back to several of the previous Don’ts. Lack of perks in combination with more problematic industry and poor morale, leading to negative word of mouth, could lead your business into a tough hiring spot. You could find that it’s nearly impossible to hire staff across the board. What you’re left with hiring are people who are not the top end of the hiring pool and instead end up the middle to low end staff. Once your business is forced to hire lesser qualified staff, your business will tank. Perks like free food, subsidized or free daycare, subsidized or free transportation to and from work. Other perks can include tuition reimbursement, travel discounts and store discounts. When you skimp on perks when other companies are not, you will find it difficult to hire and keep any talent, especially top end talent. Without top end talent, your business is doomed to mediocrity. How will this undermine your business? Once you hit the mediocrity stage, your customers will, one by one, leave you. They will realize you aren’t providing the quality service that you promised. Oh, you’ll still get some new signups, until they also realize the mediocrity of your business. Competition is fierce and it’s guaranteed that your business will have competition. If your competitors are doing it better than you, then your product/service offering will end up behind all others. It’s important to understand that top end talent drives your business forward. Low to mid level talent, keeps status quo. Top end talent provides innovation, low to mid level talent doesn’t. Once you understand this fundamental distinction between the levels of talent, you will understand why you pay top dollar to have top end talent. And note, I’m not necessarily talking about top-end talent in Director, VP, SVP or C-Level positions. While it helps to have top-end talent there, those positions do not typically get the work done day to day. It’s those doing the hands-on day-to-day work that are driving your business forward. You want motivated self-starters who are willing to own the work that they do. Low to mid-level talent won’t actually own their work. Ownership of work is critically important when looking for talented staff to hire. Note that some industries are harder to hire for than others. If you choose, for example, to open a business that does email marketing, you’ll find it very difficult to hire into this industry no matter what the position. Most technical people understand spam and realize they don’t want their resume to contain anything to do with a ‘spam related’ business. Social media offers a brand new marketing approach. Social media now offers grass roots marketing team that you have at your disposal. For example, if you can get your business placed onto certain people’s Facebook or Twitter feeds, this can drive lots of people to your business. How will this undermine your business? If you fail to understand the power of social media either by ignoring it or by assuming that it is pointless, you have deluded yourself and this immediately undermines your business. Every marketing technique is appropriate and should be exploited to its fullest. Interactive marketing is even better. If you hire people to actively scout Twitter and Facebook, they can write comments that counter any negative feedback. By hiring a team of people to manage all social media outlets, they can head off problems before they even start. By having an active team countering Twitter or Facebook posts, it shows your business is proactive and willing to counteract any negative postings by disgruntled customers. Smartphones are now ubiquitous. Yet, this technology as a marketing platform is still in its infancy. While in this infancy, you can latch onto this technology early and get an edge over your competition. Companies that choose to embrace mobile marketing now will have the upper hand when marketing on these devices becomes commonplace in the future (and when email is ultimately dead). How will this undermine your business? If you fail to understand that mobile marketing is the future, you will also fail to understand how quickly you can reach out to your customers with the immediacy of a phone call. Email, for example, is a slow mechanism by nature. It can take anywhere between 5 minutes and several days for people to read your email. With push notifications, your marketing is given to the user instantaneously. They can then go find out what the hubbub is all about within seconds. Nearly every push notification is read immediately. Emails take far far longer and are prone to spam blockers, image blockers and link blockers. Mobile marketing, at least today, is under no such blocking constraints. If you take advantage early, you can add a significant advantage to marketing for your business. To take maximum advantage, however, it must be with a solid and useful app. An app you can direct the push notification to and give critical information. If you’re a retail business, for example, offering coupon discounts for purchases can be the difference between a purchase and not, such as 20% off of a product. Discounts are always a good idea when done regularly, but infrequently. Mobile marketing needs to be relevant, targeted and location based. You need to know exactly what this customer’s interests are and provide them with spot on marketing that gives them exactly what they need when they need it. For location based marketing, if they are close to one of your stores, you should immediately send a push notification to notify them of any special offers located with that store. Or.. even every other year. This is can be a hard one to actually accomplish depending on lots of factors and it can cause severe morale problems. How will this undermine your business? Whether it’s through a firing, through so-called ‘voluntary’ severance (aka The Velvet Hammer), people quitting, demotions, promotions or lateral moves, frequent or regular departures in the upper management team creates more questions than answers for employees and, if a public company, stockholders. Stability in the upper management team (at least for 4-5 years at a time) says volumes about loyalty, stability and allows employees to recognize the upper management. Changing this team frequently says something is wrong internally. Not only do employees begin questioning what’s going on, these changes plant seeds that “maybe I need to seek employment elsewhere”. Operating a musical chair management team will undermine your ability to operate your business. It takes at least 6 months for any new hire to get his feet in a position. Changing critical management positions often means the person in the position never has time to get an understanding of what they need to get done. Worse, just about the time they are about to get something done, they’re being seen to the door. You can’t operate your business with a constant stream of new people in critical management positions. If you aren’t absolutely sure the person is the right person, don’t hire them. It’s far better to leave the position vacant for just the right person than it is to fill it with a person you know won’t work out. Additionally, if you can’t ever find someone to fill the role to your satisfaction, perhaps you’re looking for answers in the wrong place. You might want to start by looking at yourself and your expectations of the role. If you can’t clearly define the expectations of that management role, don’t expect anyone you hire to magically gain this understanding and define it for you. That will never happen. With the recent release of Lion, there is a push to get a Lion version working on VirtualBox. At present, there is yet no boot loader capable of booting Lion on VirtualBox. So, for now, Snow Leopard is still it for a standalone MacOS on VirtualBox. I will update this article as necessary to address a working installation of Lion as it progresses. Stay Tuned. There is a new CD image from Nawcom (http://blog.nawcom.com/?p=306) that makes installation of MacOS X much easier on VirtualBox (instead of using Prasys’ EFI boot CDs). And yes, I’ve tried it. The Nawcom EFI CD is much faster for installation because it does some very clever things, including installing the boot loader at the end of the install. So, I am now recommending you to download and use the Nawcom ModCD instead of the Prasys EFI boot CDs listed below. Although, I will leave the information for the Prasys Empire EFI CDs available should the Nawcom CD not work for you. Alternatively, you can try the tonymacx86.com iBoot or iBoot Legacy CDs if all else fails. Even using the Nawcom ModCD, you will still need to follow the instructions on changing the resolution of the screen as documented below as this CD doesn’t change that part of the installation process. Let’s start by saying this. Support Apple by legally buying your copy of Mac OS X. Don’t pirate it. Note also that buying a retail packaged disk from the Apple store prevents a lot of headaches during this process. A Mac OS X Install Disk that comes bundled with any Mac system will only install on the hardware with which it came bundled. For example, if you try to install from a bundled DVD media that was shipped along with a MacBook Pro, it will not install on Virtualbox and you will see the error ‘Mac OS X cannot be installed on this computer’. Save yourself the headache and get a retail disk from the Apple store. Before getting started, if you are wanting to run Mac OS X on VMWare Player 3 instead, then check out Randosity’s Running Mac OS X on VMWare Player 3 article for details. Apple wants you to buy and run Mac OS X (desktop edition) on a MacBook Pro or other similar Mac hardware. While I think that’s a grand notion to sell the hardware, the hardware will sell regardless of the operating system. Further, if you are a hardware company, why sell the operating system separately anyway? I mean, if it’s the hardware that matters, how is it that you can buy Mac OS X separately both desktop and server editions. I digress. Because Apple wants you to buy into their hardware platforms, they would prefer you not run Mac OS X on Virtual Environments. I personally think, however, that this idea is both socially and ecologically irresponsible. For a company that tries to tout itself as Green and Earth-Friendly, by not allowing virtualization of Mac OS X (any desktop version), this prevents people from using the hardware they already have and instead forces us to buy new hardware that will eventually fill landfills. Using existing hardware that may work just fine, although not made by Apple, at least keeps the hardware out of the land fill and they are still making money off selling the operating system. Note, these boot CDs support specific types of CPUs. If your CPU is not listed (i.e., Atom processor), you will need to download and use the CDs labeled with the word ‘Legacy’. These CDs may or may not work for your CPU, but these are the only CDs that have a chance of working on non-supported CPU types. Note, the faster the PC is, the better that VirtualBox will work. As stated above, you will need hardware capable of VT-x / AMD-v (BIOS level virtualization support passthrough). Without this hardware configuration, you will not be able to install Mac OS X. Most recent dual and quad core processors support this technology. Although, you may have to enter the BIOS to enable it. So, check your BIOS for ‘Virtualization’ settings and enable it. Pick your host operating system. You can run Windows 7, Vista, XP, Linux (Ubuntu, Redhat, etc) or Solaris. Whichever operating system you choose for the host, make sure it’s a 64 bit edition. I recommend Windows 7 64 bit edition as XP 64 bit edition can be somewhat of a bear to work with and Vista isn’t readily available at this point. If you’re looking for the least expensive solution, then I would choose Linux. I personally use Windows because I also need Windows 7 for other tasks as well. If you are currently running a 32 bit OS edition, you will first need to upgrade the host to 64 bit to operate Snow Leopard. Snow Leopard is mostly 64 bit now and, thus, requires a 64 bit host OS to function. Note that this tutorial was tested using Mac OS X 10.6.3 (Snow Leopard). OS X may install using 10.6.4 or later, but Apple may also make changes that could prevent it from working. If you have an older install disk than 10.6.3, the installation may fail. I recommend using 10.6.3 or later. One other thing to note about Macintosh computers and Snow Leopard… Macintosh computers require an EFI BIOS to boot. What is EFI? EFI stands for Extensible Firmware Interface and was developed by Intel for the Itanium platform in the mid-90s. This ‘BIOS’ replacement is designed to allow direct 32 and 64 bit addressing right from the firmware unlike the PC BIOS which only allows 16 bit addressing during boot operations. Yes, VirtualBox has an EFI boot system within, but this EFI system will not boot Mac OS X (probably on purpose). Instead, the Empire EFI boot ISO is necessary to boot Mac OS X (both the Mac OS X install media and the actual operating system once installed). With this post, I will focus on using Windows as the Host and Mac OS X as the guest. You can utilize this guide if you want to use Linux, but you will need to determine how to get certain steps done with Linux (i.e., creating and/or mounting ISO images). So, let’s get going. Empire EFI v.1085 for Intel P55 Chipset and Intel Core i5 and i7 8xx series , Intel Core 2 series , Intel Core series (Contains both EmpireEFI v1.085 and LegacyEmpireEFI v1.085) <– If unsure, try this one first. Empire EFI v1.085 for Intel Atom , Intel Core i7 9xx series , Intel Core 2 series , Intel Core series (contains both Empire EFI v1.085 and LegacyEmpireEFI v1.085) <– Try this one second. Empire EFI V.1085 (Based upon on Version 1.00) – Meant for Intel Graphics 950 , 965 (X3100 Users) who’ve tried another version which has resulted in kernel panic or white screen. Note: You only need one (1) of these ISO images above. So, you will need to pick the ISO image that works for your motherboard. Also note that Empire EFI requires at least 1024MB (1GB) of RAM to work. Also, I can’t guarantee how long these download links will continue to work, but as of 6/30/2010 they are working. See: Google’s cached Prasys blog page for important details about these disk images. No, it’s not formatted. Also under Storage, click ‘Empty’ cdrom drive and set the Empire EFI disk to this drive using the Folder icon****. Now you’re ready to start the install process. Click the ‘Start’ button to start the Mac OS X virtual machine. Once the Empire EFI screen has loaded, eject the Empire EFI ISO image by unchecking it from the Devices->CD/DVD Devices Menu and then locate your Mac OS X Install ISO and select this. If you have the original media and want to create an ISO, go to the ‘Creating an ISO image with ImgBurn’ section below. After the Mac OS X install ISO is selected and you’re back at EFI, press the F5 key. The screen should refresh to show the newly inserted Mac OS X install media. Once it shows the install media, press the enter key to begin installation. Note, if you start this process using the Empire ISO image, then you must use a Mac OS X Install ISO. If you want to use the physical media, then you’ll need to burn the Empire ISO to a CD and boot from the physical media drive in VirtualBox. You can then eject that media and insert the Mac OS X install media. You cannot mix and match ISO to physical media. I was not able to get mixing ISO and physical media to work in Empire EFI. Once you get the Mac OS X Installer going, I’ll leave it up to you to finish the full install process. However, I will say this about the hard drive. The VBox HD is blank. So, you will need to prepare it with ‘Disk Utility’. Once the Mac OS X installer starts and you get to the first screen with a menu bar, choose Utilities-> Disk Utility. It will recognize the Disk is there, but it cannot be used until it is partitioned and formatted. Choose the VBox disk and click the ‘Erase’ tab. Under Erase, choose Mac OS X Extended (Journaled) and then name it ‘Hard Disk’ (or whatever you want to call it) and click the ‘Erase’ button. It will confirm that you want to do this, so click ‘Erase’ again. Exit Disk Utility and continue the installation. It will probably take 30-40 minutes to install Mac OS X depending on various factors. Mac OS X Installed — What’s Next? If you’ve installed from the Nawcom ModCD, then skip this part and go directly to Final Steps + Increasing screen resolution. If you’ve installed from tonymacx86.com’s CD, you may still need to install MyHack. If you’ve installed from Prasys’ Empire EFI CD, you will need to install MyHack. So, continue on. Ok, so now that Mac OS X is installed, the system still won’t boot up without the EFI disk. So, reboot after the install with the Empire EFI ISO in the drive. Choose the new bootable ‘Hard Disk’ in the EFI menu and boot into Mac OS X. Once Mac OS X is loaded, open Preferences and set the ‘Startup Disk’ to your new bootable installation. Now, open Safari and search Google for ‘MyHack’ or locate this Randosity article in Safari and go to this site: MyHack. The download will be a package (.mpkg) file and needs to be downloaded on Mac OS X. Once downloaded, double-click the package to install. Click through the Wizard until you get the screen with the ‘Customize’ button. Click Customize and enable PS2Controller (keyboard and mouse) and disable SleepEnabler (doesn’t work with later OS X versions). Click to finish the installation process. After MyHack is installed, you can eject the Empire EFI media and your Mac OS X installation will now boot on its own. You’ll notice that the resolution is fixed to 1024×768. You can change this resolution, but it has to be done in two files. First on Mac OS X, there’s the /Extra/com.apple.Boot.plist file. This file describes the resolution for the Mac to use. Before you edit this file, install Xcode from the Mac OS X media (insert it into the drive with the Mac running). Open ‘Optional Installs’ folder and double-click ‘Xcode’ and follow the installation instructions. Note, it takes about 2.3GB of space. Plist files are easier to edit when the Property List Editor is installed from Xcode. Otherwise, you will have to hand edit these files with TextEdit. Also note that the /Extra folder is at the root of the Hard Drive volume. It is not inside your local user profile folder. You will also note that after a default install, Mac OS X doesn’t show hard disk icons on the desktop. To turn this icon on, from the top menu, select ‘Finder->Preferences…’. Then, put a check next to ‘Hard Disks’ under ‘Show these items on the desktop’. Once you open the Hard Disk icon, you should see the Extra folder. If you still don’t see the Extra folder, be sure that you have installed MyHack or used the Nawcom ModCD. If MyHack hasn’t been installed, there won’t be an /Extra folder there. The Extra folder gets installed as a result of installing MyHack. VBoxManage setextradata "Mac OS X" "CustomVideoMode1" "1920x1080x32"
The “Mac OS X’ label is the exact machine name in VirtualBox. The “1920x1080x32” setting is customizable to your needs (and video card capabilities). However, both this setting and com.apple.boot.plist (on the Mac) must match for the screen resolution to take effect. The ‘VBoxManage’ command is located in the Program Files\Oracle\VirtualBox folder or wherever you installed VirtualBox. You can add this location to your PATH variable so you can use this command without typing in the full path each time. (The resolution value should match the above VboxManage command). If you want to change resolutions later, you will need to edit both places again and reboot your Mac. If you reboot and the screen hasn’t changed or has changed to 1280×1024 and not the resolution you expected, double check that both com.apple.boot.plist and the CustomVideoMode1 setting match and are active. Both of these settings must match for the resolution to work. It’s easiest to edit this file with the Property List Editor tool. So, install Xcode before managing this file. In order to edit this file, you cannot edit it directly. Instead, copy the file and paste it to your desktop. Edit the file on your desktop. Then, once done editing, drop the file on top of the /Extra folder. Click “Replace File” when asked and supply your account password. Once the file is replaced, you can reboot to see if the resolution change has taken effect. Update: On my HP quad core system, I am unable to get the AC97 sound driver to work on 10.6.4 (as have others). I have uninstalled and reinstalled this kernel extension, but it simply will not activate. I am still working with this setup to see if I can get it working, but so far no luck. I should point out, then, that the AC97 sound driver may not work on all systems and may not work with 10.6.4. So, you may not want to update to 10.6.4 until this issue is resolved if you need sound. Mac OS X does support audio output with an AC97 audio driver in Snow Leopard up to 10.6.3. It does not appear to support audio input. I will say, however, that the audio driver is, at best, under performing. That means, it breaks up, it doesn’t always work and it generally sounds crappy. That said, if you want to hear the various insundry noises that the Mac can make for bells, you can install the driver. The AC97 driver can be found in this Virtualbox Forum Thread. Note, if the supplied installer does not properly install the driver, download the .zip file and install the AppleAC97Audio.kext Extension the into /Extra/Extensions folder. Then follow the instructions below on rebuilding the Extensions.mkext file. Running these commands will rebuild the cache files necessary to activate newly installed extensions. So, if you need to install any new extensions, you will need to run the above commands to recreate the extension cache files. To create an ISO image using ImgBurn, you will first need to download and install it. Once it’s installed, start it up. Now click ‘Create image file from disc’. Insert the Mac OS X CD. The CD will be labeled ‘Boot Camp’. This is fine as this is the only partition that Windows is able to see. As long as it sees the ‘Boot Camp’ partition, the image will be created correctly. Click the CD icon at the bottom of the Window to create your ISO image. Once the image has been created, you can continue at your previous step. As a side note about rebooting. With some hardware, rebooting Mac OS X in VirtualBox doesn’t work. Sometimes it seems to hang, sometimes it gives a banner telling you to power off the machine. Basically, there isn’t really a resolution to this issue. Simply use shutdown, then when it appears all disk activity has stopped, close the Vbox window (making sure to power it off). Then click ‘Start’ again to start it up. This is really more of an inconvenience than anything, but it’s manageable. If the update causes your system to stop booting, stop working or in any way become broken, you can revert to the snapshot and not update. On the other hand, if the update works perfectly, then I recommend you delete the snapshot once you feel comfortable that the update is working as expected. If the update doesn’t work, you may need some updated components such as the Chameleon boot loader or an updated boot disk to handle the new OS update. * I suggest using a VMDK HD image as there are more tools for VMDK format files than VDI files. Though, your choice. If you want to use a VMDK file, go to vmcreator.com and have them make you a file to download. ** VirtualBox’s EFI works, but not with Mac OS X. Whether that’s intentional is unknown. Instead, you need to use the Empire EFI ISO disk to boot Mac OS X to install it. *** You may have to enable VT-x/AMD-v in your machine’s BIOS. **** Click the ‘Add’ button in the Media Library window to locate your ISO image, then make sure this file is selected and click ‘Select’.